This pretty, healthy dessert is perfect for any outdoor summer party. Add bananas for a red, white and blue dessert. Serves 18. On a flat surface, with a sharp knife cut half the watermelon into large slices, about 1/2-inch thick. With a metal star-shaped cookie cutter, cut star shapes out of the watermelon slices. Cut remaining watermelon into 2-inch cubes. In a large bowl, combine the watermelon cubes, the blueberries, raspberries, and strawberries. Toss gently to combine. 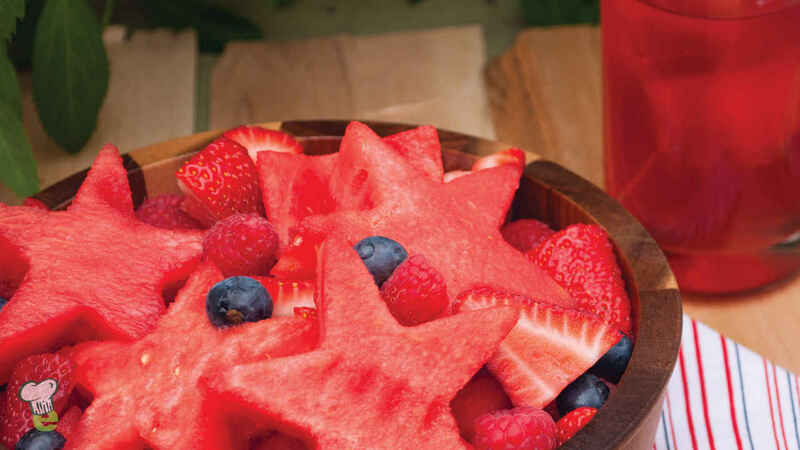 Add the watermelon star slices and sprinkle with lemon juice.